Last week, Vietnam and the UK held another defense-related meeting. While the meeting was just one of several within the broader UK-Vietnam strategic partnership, it nonetheless highlighted some of the activity within a defense relationship that has been making inroads amid wider domestic and foreign policy developments in recent years. As I have observed before in these pages, the United Kingdom and Vietnam have a bilateral relationship that also includes a defense realm as well. Both sides had already been cooperating in several areas, including the U.K.’s sharing of its expertise to help Vietnam in its first UN peacekeeping mission in South Sudan. They have also been looking to strengthen this aspect of ties still further amid wider trends, including Britain’s effort to boost ties with Southeast Asian states post-Brexit, and Hanoi seeing Britain as among a range of powers to engage across the board as it seeks to deal with a series of challenges including the South China Sea disputes. This trend has continued on over the past year or so. 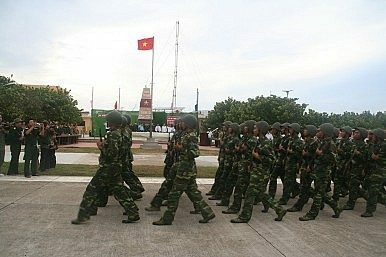 To take just one example, in late November, in a landmark development for UK-Vietnam defense ties, both sides finally held the first iteration of the UK-Vietnam defense policy dialogue at the deputy ministerial level, where they inked a cooperation document on geospace and also discussed various areas where collaboration could be furthered, including exchanges, training, and the defense industry. Last week, the defense aspect of the relationship was in the headlines with another defense meeting focused on military medicine. Stuart Miller, the chief of medical operational capability at the UK defense ministry, was on a visit to Vietnam where he and his delegation met with a number of Vietnamese officials on boosting collaboration in this vein. Miller’s trip included a series of engagements, among them being meetings between him and his delegation with Vietnamese officials including Nguyen Tan Cuong, the deputy chief of the general staff of the Vietnam People’s Army (VPA). Per official Vietnamese accounts, during the discussions, Miller and Cuong discussed a range of matters. Some of these were related to bilateral ties, such as the UK’s assistance with Vietnam’s ongoing UN peacekeeping mission in South Sudan as Hanoi looks to position its second level-2 field hospital to replace the first one at the end of this year. They also discussed future areas of collaboration, including on military medicine, as well as regional and international issues of common interest. Unsurprisingly, not much in the way of specifics was stated publicly about the private deliberations held by both sides. Nonetheless, the future direction of both the defense relationship in general as well as specific areas such as military medicine will continue to be notable to watch amid wider domestic and foreign policy developments in both countries on their own terms. What’s Next for Vietnam-UK Relations in 2019?Warship Visit Spotlights UK-Brunei Military TiesMark Field on Strengthening UK-ASEAN Relations Post-BrexitA New British Military Base in Southeast Asia?What’s in the New Vietnam-UK Defense Dialogue?